My First Adgitize Payment! | To Be, To Be. Tutubi. 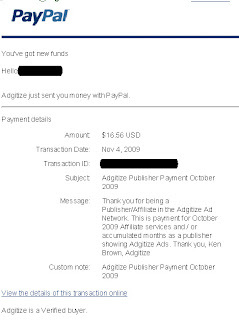 I just received my first payment from Adgitize! I started Adgtizing last September 17, and is happy to report that I got USD16.56 already. Wow! I have only paid USD28 for the two months I have been advertising but after being paid, in effect I only paid USD9! Not bad for the increase in page views and the corresponding increase in opportunities! So, why not try Adgitize now? wow, congrats! that's great right? I mean, you get traffic and you get paid for just doing the thing you love. huuray! congratulations on your payment! and good thing I saw this because, I checked my mail also and I got paid too! I've been a member of Adgitize for a year now, and so far I'm still happy with their services. Droped EC and Adgi here. Hello Dina. Congrats. Ngayon ko lang nabasa to. ako wala pa payout sa adgitize. Ngayon pa lang kasi ako nag aactive. Pero sa adsense naka tatlo na ako whehehe. nag member ako sa adgitize about a month ago tapos i received an email to tell me that i was declined.